Posy Puzzler: What’s The Lone Ranger’s Favorite Flower? I’m working on a marketing project for a very distinguished client: me. It’s titled 13 Reasons To Hire An Illustrator. Naturally, I’m hoping that people will hire me, but I’m focusing on a wider truth: an illustrator can deliver unique value. It pays to hire an illustrator to help you send the right message. My ultimate goal: create a video I can post on YouTube, and a corresponding slideshow for Slideshare. Obviously, I need a slide for each of the 13 reasons. Here’s the 14th (below). 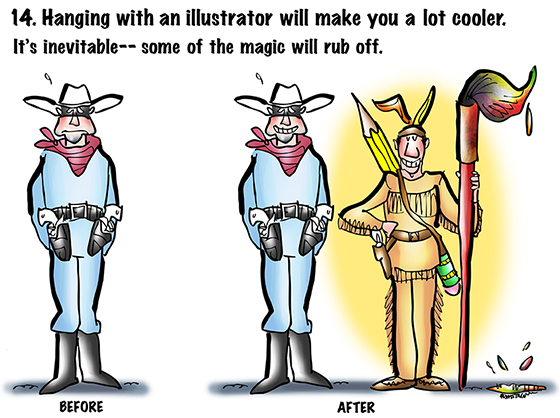 Many readers will recognize my cartoon homage to the Lone Ranger and Tonto— but some readers may not. The two are part of American pop culture, fictional characters who roamed the Old West, good guys who captured outlaws, righted wrongs, and always played fair. 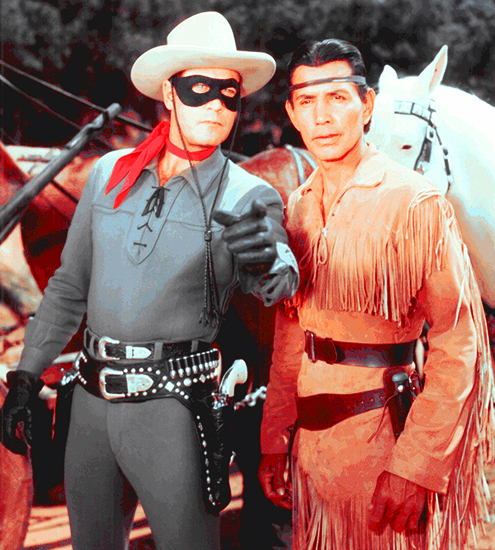 My characters are based on the two actors best known for the roles: Clayton Moore and Jay Silverheels (below), who played the Lone Ranger and Tonto, respectively, in the old 1950s American television series. Both men played the roles straight, projecting the absolute integrity of the characters. Later movie adaptations took a much looser approach– and failed at the box office. the joke is that the Ranger was always the hero; Tonto was just his sidekick, his “faithful Indian companion.” Now that he’s a cool illustrator, Tonto suddenly has the upper hand. And finally, the question that’s on everyone’s mind: what’s the Lone Ranger’s favorite flower? by a pal of mine named Eric Meisfjord, who happens to be The Fastest Punster In The West. Well, the fastest in Washington State, anyway. Are you a Lone Ranger fan? Do you know the real name of The Lone Ranger Theme? 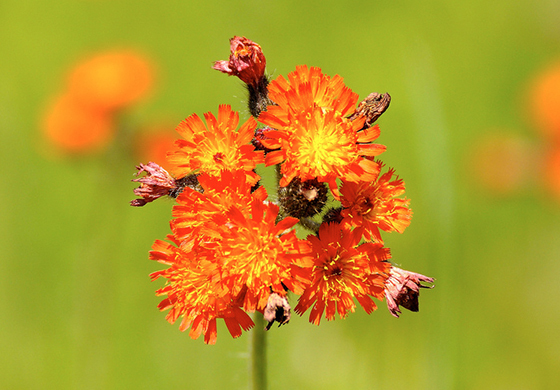 Had you heard of the Indian Paintbrush? Ae you someone who can identify wildflowers? Ever hired an illustrator and immediately become cool by association? I’m disappointed to hear The Lone Ranger’s favorite was Indian Paintbrush which is lovely. I thought his favorite would be Bachelor Button. I’ve never hired an illustrator but if I do you will be at the top of my list. Your first sentence made me murmur, “Oh, dear!” Your second made me roar with laughter. Your third made me do my beet-nik impression because my face turned so red– with pleasure and happiness, I mean. Thank you, TT, for that wonderful comment!! You’ve got yourself a difficult client there, Mark. I can imagine the dialogues and the fights! Note to potential clients: Hire this man and let magic unfold! This wonderful comment put me in a quandary: I couldn’t keep up with my emotions: I laughed, I cried, I blushed, I jumped for joy! Then I ran down to the flower shop to order you the world’s biggest bouquet of Indian Paintbrush. But the flower lady shook her head sadly. I’m a huge fan of the 1950s “Lone Ranger” with Clayton Moore as the Lone Ranger (1949-52 and 1954-57) and Jay Silverheels as Tonto. (John Hart played the Lone Ranger from 1952-54). I adored them both. If you’ll be my jokeguard, I’ll be your long lost pal. I can call you Mark and Mark, when you call me, don’t call me Al. Ha! You’re totally “rad,” all right– I think I finally understand the origin of that slang expression!! An Indian-American dance team, with Bollywood panache and growling saxophones?? I like it!! I’ll make a few calls, and see if I can get us on next season’s Dancing With The Stars!! The Indian Paintbrush is type of flower?! I feel like I’ve learned so much from this post. So reading your cool blog and my husband walks into the room he of amazing trivial facts aand I said “Jay Silverheels was canadian” only thing I said..because it seemed self contained and important. And he didn’t get it. He said “So what’s that supposed to mean?” Sadly he must not be a visionary or else he’d know that tidbit will serve him well sometime in the future, though today it’s all about love and candy. As long as the paint brush is not made from Silver’s tail! And I like the idea of your wall poster… Well expressed and detailed.